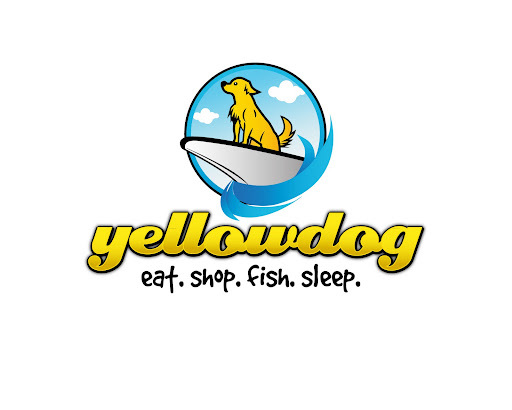 Please visit our website at www.ouryellowdog.com. Wow, so apparently it's been so long since we've had a blog post that I couldn't even remember how to make one. There's a whole new format. Whoops. So, aside from not having much of interest to post, things were just really busy this winter/spring. That's a good thing! Our 2 cottages, the Redfish and the Tarpon, were booked solid in February and March, and had a decent smattering of reservations in Dec, Jan, and April. May is looking about the same. We also have 6 weeks booked already for Winter 2013! The boutique has had a steady stream of business. Not quite to the extent that our tenant had hoped for, but between the economy, the bridge construction, and just being a new business, it's not doing too badly. Now that we can actually stay in our own cottages on the weekends here and there, we've been doing little improvements to the outdoor areas. Cleaning up the landscaped areas, adding mulch, painting some decor to brighten up, adding some items of interest, etc. We hadn't focused much on the outside until recently, but having the time and motivation to get to work out there is really making everything look so great! Next up will be painting the docks. Not sure if it's just age/wear and tear or our two (yes, two) dogs running around that is making the paint come off....but it's time to give it a new coat. So speaking of the newest Yellowdog, meet Fisher. We got him at 9 weeks old. He is Tiki's half brother (they have the same father), and just as beautiful and smart and sweet as the original Yellowdog. Here are some pics taken on 4/8 and 4/22. Kicking the corporate world to the curb and combining our collective "talents" to live and work in Matlacha, Florida.